Immediately following the Mariners game on the night of the 24th I had a decision to make. 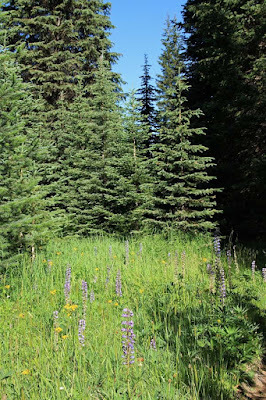 My original plan was to drive straight to Mount Rainier and try for Boreal Owl, which is a rare but likely under-detected breeder at high elevation in the Cascades. 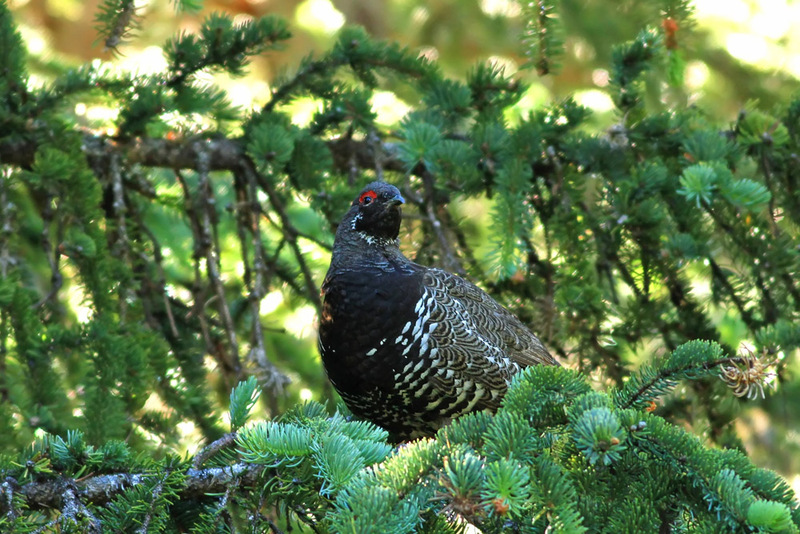 But Ryan had just gotten a lead on potentially reliable "Franklin's" Spruce Grouse near Mount Adams, south of Mount Rainier and definitely further afield than I had planned on going this week. 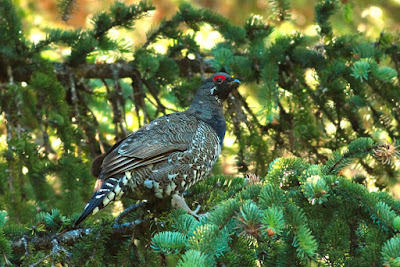 If I wanted to be at the Spruce Grouse area for dawn, when they are likely to be most active, I did not have enough time to try for Boreal Owl at Rainier. 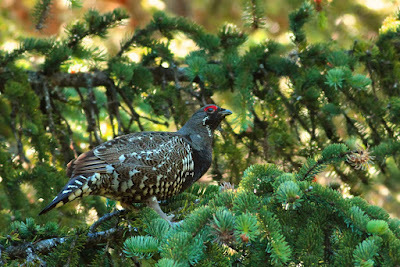 Since I have seen Boreal Owl a couple times in the east, I could not help but go for the "Franklin's" Grouse, which is a subspecies restricted to the Cascades and Northern Rocky Mountains. According to research, this is likely a different species than the Spruce Grouse we know from the rest of the North American boreal forest. 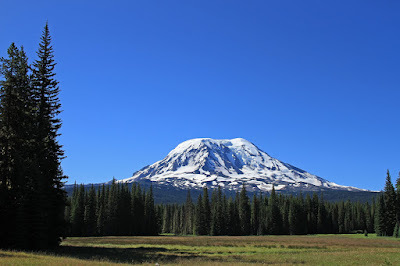 So I left Seattle with a 4+ hour overnight drive ahead of me. The drive went well, and the several miles of dirt forest road were in pretty good shape. I arrived at the location in time for dawn after a bit of stopping to listen for owls on the climb (a single Barred only). Temperatures were chilly in the mid-40s, the coldest I would see this week. 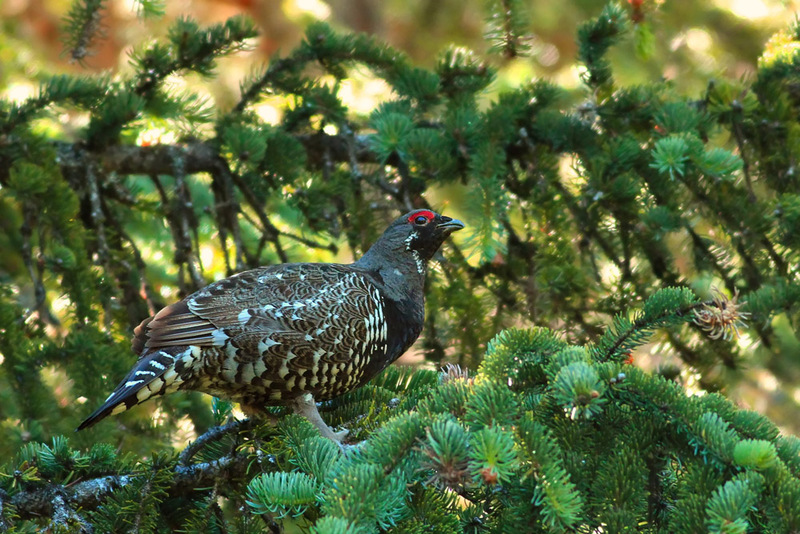 The first few hours went without a trace of any grouse, but there were birds to be seen. Red Crossbills (Type 3), Evening Grosbeaks and Pine Siskins were calling overhead. Lincoln's Sparrows were singing from the meadow. 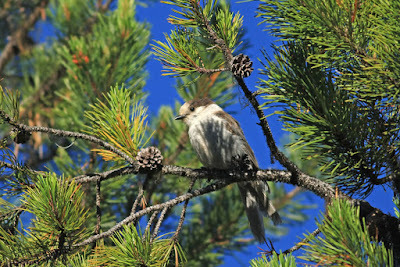 "Audubon's" Yellow-rumped Warblers and "Oregon" Juncos were feeding recently fledged young. 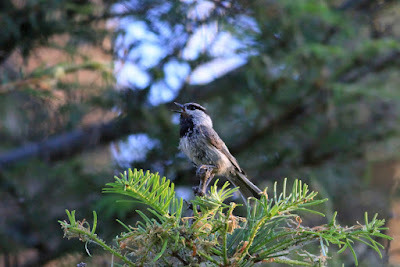 A family of Gray Jays moved noisily through. I was smack in the middle of the Townsend's/Hermit Warbler hybrid zone, and their buzzy songs were ringing though the air. I got good looks at just a few - two Hermit-like hybrids and one rather pure-looking Hermit. I headed in the direction the tracks were pointing, and after no more than five minutes I spotted a male Spruce Grouse about 15 feet off the ground feeding in a [presumed] fir. Incredibly satisfied with the results, I began a long drive toward Leavenworth, where I would search for Black Swift in the evening. On the way back down those forest roads a Ruffed Grouse crossed in front of the car. I did sneak in a few quick roadside stops along Route 12, mainly east of White Pass. 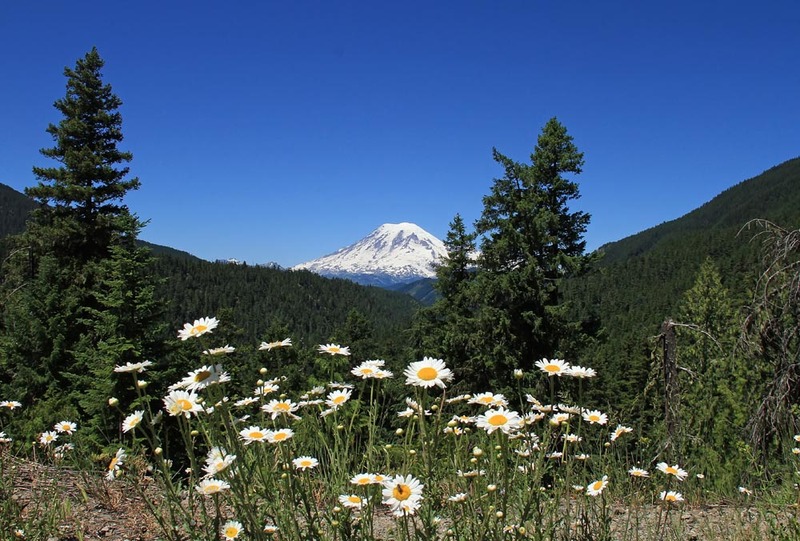 As you go up the east slope of the Cascades, over the pass, and back down the west slope, you drive through various vegetation zones that each have their own set of breeding birds. Knupfenburg Lake, right along the highway, held a female Barrow's Goldeneye and a family of American Dippers in a rushing stream. On Leech Lake were a single Ring-necked Duck and another hen Barrow's, this one with small chicks in tow. A Vaux's Swift flew over, and Rufous and Calliope Hummingbirds were zipping all over the place. As I came down the east side, as the habitat transitioned to oaks and riparian along the Tieton River, Lewis's Woodpeckers could be seen rather easily from the car. Ponderosa Pine - on the "dry side" of the Cascades. A far cry from the lush spruce-fir of the Olympics and west (AKA wet) side of the Cascades. 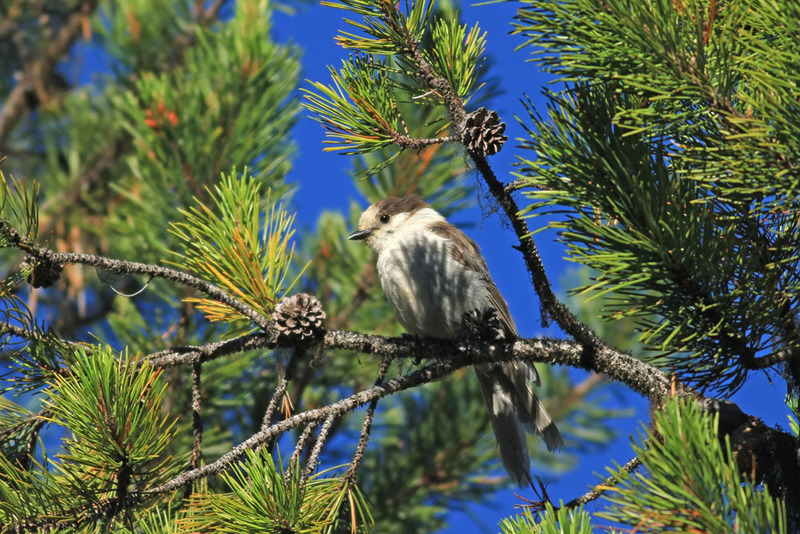 As the habitat changes, so does the bird life. Eventually I made it to the Leavenworth Fish Hatchery, where I would scan the skies for Black Swift, a species that had eluded me during previous visits out west. Over the course of an hour I had views of a handful of Black Swifts in the valley. What a day - perhaps the best of the trip - starting with Spruce Grouse and ending with Black Swift, and a whole bunch of great stuff in between. Though I had been up for over 40 straight hours at this point, my adrenaline motivated me to try for Flammulated Owl in the Camas Creek area. I arrived at Camas Creek Road before 8:30pm, with enough light to spare for some birding along road. The roadside was alive with birdsong the whole way up. Flycatchers were particularly well represented, by Olive-sided, Western Wood-Pewee, Willow, Gray, and Dusky. 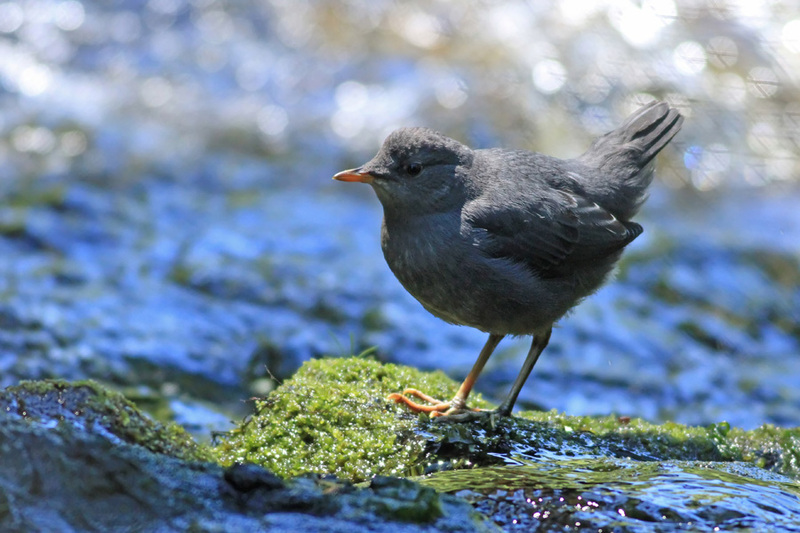 Thrushes (Swainson's, Hermit, Veery, Robin, and Townsend's Solitaire) were also incredibly vocal. Red-naped Sapsucker was new for the trip, as was Cassin's Finch, and Western Tanagers were particularly common. The birding was phenomenal, right up to the point where it was getting difficult to see. Then the Common Nighthawks took over, with constant 'peenting' and 'booming' overhead. They were everywhere. 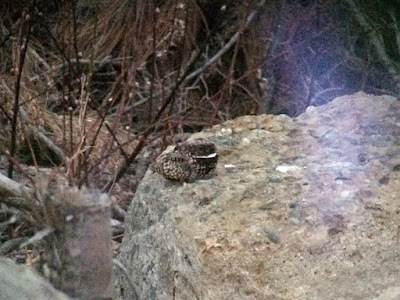 The last species to start calling was Common Poorwill, one of which was incessantly singing from the top of a boulder before it got dark, allowing for killer prolonged scope views. By this point the lack of sleep was catching up to me and I was fading fast. Owling wasn't really going to happen. I tried the purest few stands of Ponderosa Pine for Flams on my way back down the road, but came up empty. I decided that a dedicated effort would have to wait until the following night. 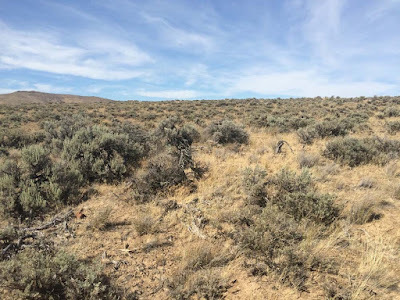 I spent all of today on the east side of the Cascades, starting all the way east of the Columbia River, in the hot and dry shrub-steppe. This altogether different habitat couldn't have been much different from the cool, moist coniferous forest of yesterday morning. I focused the morning on a few lakes and potholes in search of waterbirds. Winchester Lake was rather quiet, but seeing Western Grebes carrying young on their backs is always something worth seeing. A single American White Pelican here was the only one I would see this week. By far the coolest place I birded east of the Columbia was the North Potholes Reserve. 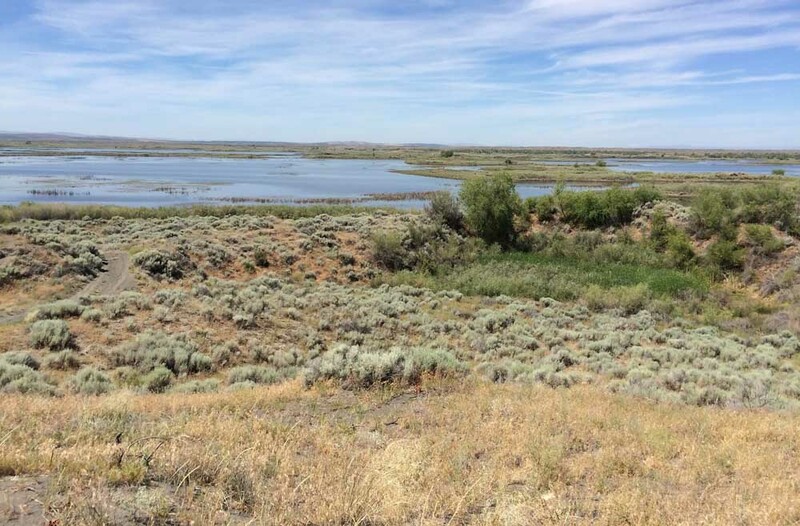 This far north end of the Potholes Reservoir was a network of shallow, muddy bays bordered by deciduous vegetation and surrounded by acres of sage. Ducks were highlighted by several Redhead and a Cinnamon Teal. Great Egrets and Black-crowned Night-Herons hunted the edges. Pied-billed Grebes were intermittently giving their comical, laughing calls. This looked like it could be very productive for shorebirds during peak migration, but the only apparent migrant today was a Greater Yellowlegs. Forster's and Caspian Terns were patrolling the waters back and forth, but a single breeding-plumaged Black Tern was probably my favorite bird of the stop. The passerines here were also worth noting. Eastern and Western Kingbirds were flycatching side-by-side. Lark Sparrows were conspicuously singing. A colony of Yellow-headed Blackbirds was noisy and active. 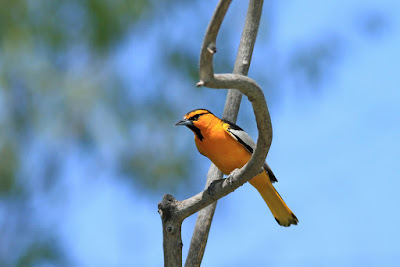 Black-headed Grosbeaks and Bullock's Orioles were also easily observed. From there I checked a couple of small roadside pools that have a history of being productive for their size. I turned up a pair of Black-necked Stilts at the first pool, and a calling Sora at the second. 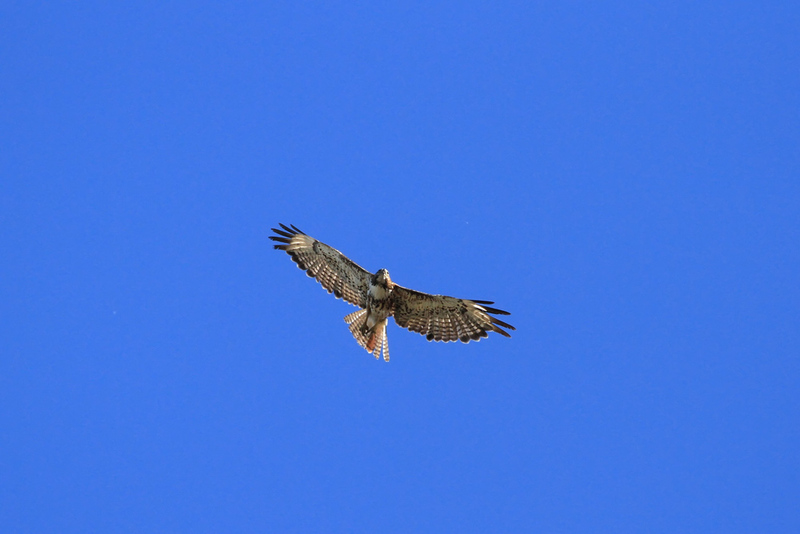 A sharp light morph Swainson's Hawk flew over the car as I was driving back west. By this point it was early afternoon and temperatures in this harsh environment had reached 104 degrees, which the locals were saying was unseasonably warm for late June. 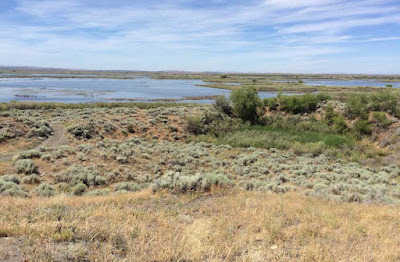 I drove back west over the Columbia River and headed to the Old Vantage Highway, a road well-known for its sage birds. I wasn't sure much of anything would be active in that heat, but one productive area had Sage Thrasher, Sagebrush Sparrow, Brewer's Sparrow and Vesper Sparrow. Not bad! After a bit of hydration and deliberation I thought it best to head straight for Flammulated Owl territory near Liberty. 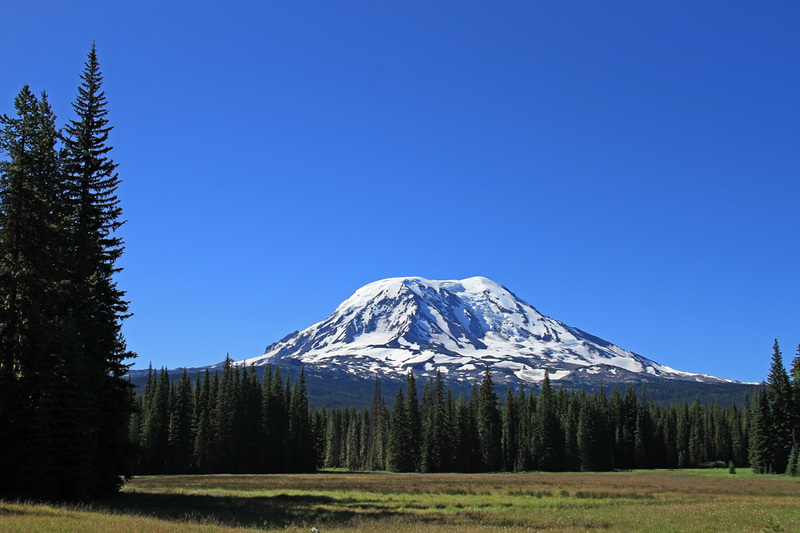 This mountain community's origins date back to the late 19th century, when gold was discovered in the adjacent stream. 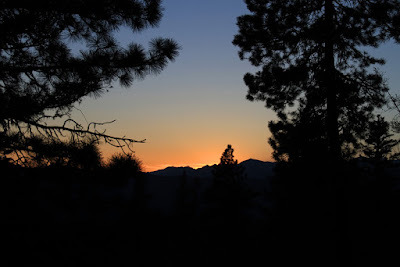 My plan was to slowly bird my way up the mountainside, all while scouting Flam habitat (= Ponderosa Pine) for owling after dark. On the way, a couple of "Western" Red-tailed Hawks circled over the road. Just like the previous evening at Camas Creek, the birding was great. This time I arrived at 6:30pm so had a good 2-3 hours to work my way up the forest road before dark. Lots of activity and song. 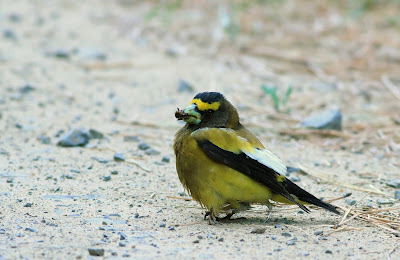 The most abundant birds were finches, with Pine Siskins closely followed by Evening Grosbeaks. Recent study of Evening Grosbeaks has shown that they, like Red Crossbills, are divided into several different "call types" that vary by region. Unlike the crossbills, however, the grosbeak call types do not overlap much geographically, and their distribution by call note seems to correspond well to previously described subspecies. As expected, all of the grosbeaks I heard this week sounded like Type 1 birds. I recorded a few, including some tonight, and confirmed that identification via spectrogram. The species mix was pretty similar to what I had at Camas Creek, as expected given the similar habitats. However with more time I was able to turn up several more species here. New for the trip were Williamson's Sapsucker and Cassin's Vireo. Other highlights included Mountain Chickadees, Townsend's Solitaires, six species of warbler including Townsend's, and both Purple and Cassin's Finches. I had noted the places that looked best for Flammulated Owl and headed towards the first stop once it was pretty dark. On the way there, a pair of duetting Great-horned Owls would be a good omen. At the first place that looked really good was, sure enough, a calling Flammulated Owl. 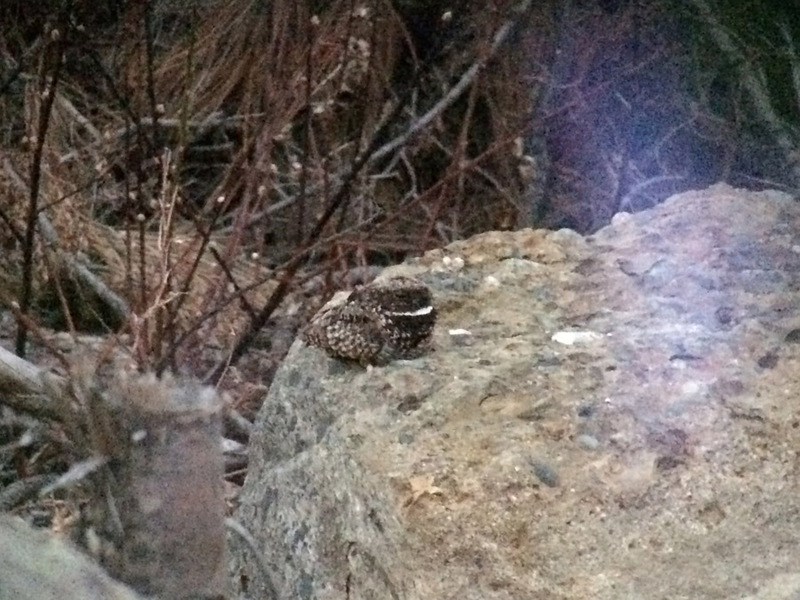 I threw on a headlamp and hiked up the slope and was quickly rewarded with a calling Flam right in the open. Well worth the effort. This also happened to be my 700th ABA Area bird. Glad it wasn't Sky Lark! Happy with the views of the Flam, I would just stop at a handful of pulloffs to briefly listen for owls on my way out. Apparently it was a really good night for Flams - four more were heard along the way.